Random House Trade Paperbacks, 9780812985351, 288pp. Fortune, mania, genius, philanthropy—the bestselling author of Mountains Beyond Mountains gives us the inspiring story of Paul English, the founder of Kayak.com and Lola. 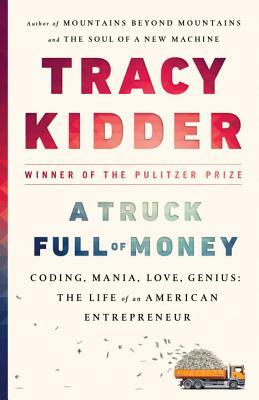 Tracy Kidder, the “master of the nonfiction narrative” (The Baltimore Sun) and author of the bestselling classic The Soul of a New Machine, now tells the story of Paul English, a kinetic and unconventional inventor and entrepreneur, who as a boy rebelled against authority. Growing up in working-class Boston, English discovers a medium for his talents the first time he sees a computer. As a young man, despite suffering from what would eventually be diagnosed as bipolar disorder, he begins his pilgrim’s journey through the ups and downs in the brave new world of computers. Relating to the Internet as if it’s an extension of his own mind, he discovers that he has a talent for conceiving innovative enterprises and building teams that can develop them, becoming “a Pied Piper” of geeks. His innovative management style, success, and innate sense of fair play inspire intense loyalty. Early on, one colleague observes: “Someday this boy’s going to get hit by a truck full of money, and I’m going to be standing beside him.” Yet when English does indeed make a fortune, when the travel website Kayak is sold for almost two billion dollars—the first thing he thinks about is how to give the money away: “What else would you do with it?” The second thing he thinks is, What’s next? Tracy Kidder graduated from Harvard and studied at the University of Iowa. He has won the Pulitzer Prize, the National Book Award, the Robert F. Kennedy Award, and many other literary prizes. The author of Strength in What Remains, My Detachment, Mountains Beyond Mountains, Home Town, Old Friends, Among Schoolchildren, House, and The Soul of a New Machine, Kidder lives in Massachusetts and Maine.